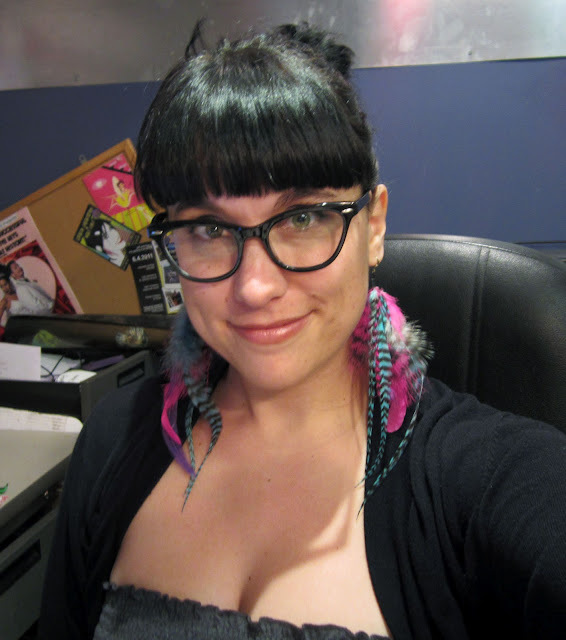 Beth's Super Awesome Blog: MY NEW AWESOME CAT-EYE GLASSES! I got them at Zenni Optical online. I was actually really super nervous about ordering glasses online, but since buying them in stores were SO EXPENSIVE, I decided to take a chance. And I'm so glad that I did! They have this little online try-on feature that I used (I uploaded a ridiculous photo of myself - but I could only find one that was straight-on! ), and you have to be sure you get the right measurement from pupil to pupil (I just did this in a mirror with a ruler). Easy peasy! I got the frames, plus lenses, plus scratch-proof coating, PLUS anti-glare for $48!! THAT INCLUDES SHIPPING!! Can't really beat that. Oh wait, yes you can! I got reimbursed for $39.90 of that by my health insurance plan. WOOT!! They come in brown too. :) Hope that helps! Hi Beth! You look so cute with your glasses. It matches the color of your eyes and the shape of your face. I’m glad that you easily found the glasses that you want online. And it’s pretty cheap at $48 too! I also love wearing cat eyeglasses that look like this. It makes me feel smarter and more respectable. It's good to see that you're able to get your new cat-eye glasses. I have to say that it does indeed look awesome on you.